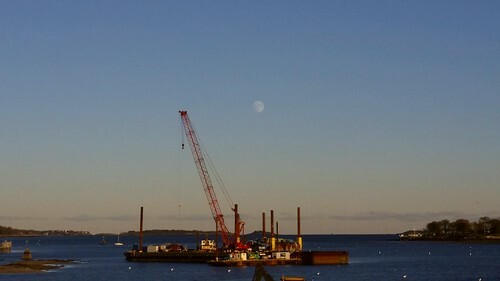 The moon rising up in mid-afternoon over the water and a barge out in the river. The view from the Salem-Beverly Bridge affords me many photo opportunities and this was certainly one of them. Something about the mixture of colors on the barge, the surrounding water, and the sky might have been enough to take a photo, but the moon hovering right above, ascending into the blueness of the sky as if escaping the horizon of light yellow. It all came together quite well with me just trying to figure out which of the photos and angles worked out best.